– 20 pre-set programs, of which 4 can be linked to 4 keys on the keypad and the other 16 can be recalled through the menu (all can be reprogrammed). – 9 programs set in self-learning mode. – Display to view the programs and machine operation. – Transparent silencing bell available on request. – 2 litre capacity, built out of transparent, indestructible Tritan, graduated in litres, UK and U.S. gallons. – Knife support in stainless steel that can be fully and easily disassembled from the glass body. Knife with 4 spokes obtained from a single mould in tempered cutlery steel. The square glass has been developed to ideally work with large quantities of ice, even dry. – Handy and practical: you can pour the product in 3 different directions. – Perfect to prepare frozen drinks or smoothies with syrups and concentrates. – Multi-point motor puller in stainless steel. 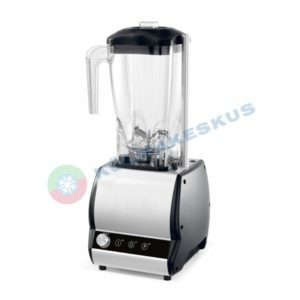 • Round 2-litre glass, ideal in the preparation of shakes and frozen drinks, made in stainless steel. • Orione Timer: manual adjustment timer and automatic machine switch-off.